Modern domestic dogs – or what you and I simply refer to as dogs – are believed to have evolved from the grey wolf around 20,000 – 30,000 years ago. This means that thousands of years ago – and over the course of thousands of years – grey wolves changed and evolved so they could survive and thrive under different conditions. 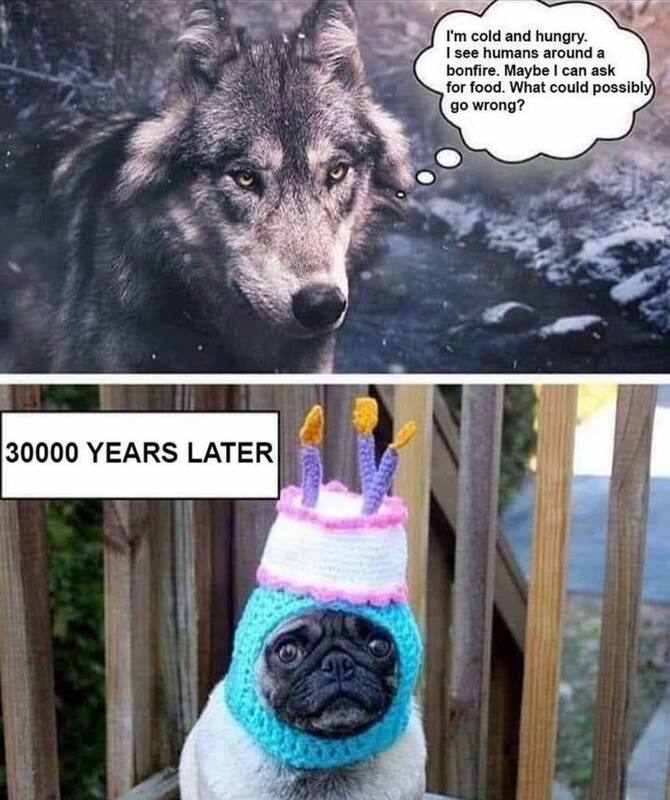 This evolution gave rise to dogs. There is evidence which suggests that as humans began to form settlements and communities, grey wolves began to ‘hang-out’ around them and scavenge in these settlements for food. This behaviour would have placed them in close proximity of people. In evolutionary terms, behaviour like this would have ‘selected’ for characteristics like reduced fear and an increased dependency on humans for food. Over thousands of years, this partnership and dependency increased and the domestication continued, eventually giving rise to what we have today – man’s best friend. This theory of how domestic dogs evolved is called the ‘village dog’ hypothesis and was first proposed by Dr. Ray Coppinger. There are other theories on the domestication of wolves but Dr. Coppingers is the more widely accepted theory. Although dogs and wolves can share some similarities, it’s pretty clear that dogs aren’t wolves. This is when you try to imagine training a wolf catching a frisbee a dozen times in a row, or witnessing a pack of pugs taking down and feasting on a kill. And even though certain breeds of dogs share some traits and characteristics with wolves, this doesn’t mean these dogs are socialized wolves. Similarities doesn’t equate to sameness. To better understand how modern domestic dogs differ from their grey wolf predecessors, scientists have been studying and comparing their DNA. In particular, they focused their attention on genes involved in diet, and the process of starch digestion. This is because it’s known that while dogs can breakdown starch, wolves can’t. What scientists have discovered through research is that the reason dogs can breakdown starch is because they have the genetic machinery – three genes called AMY2B, MGAM and SGLT1 – which are necessary for the starch digestion process. 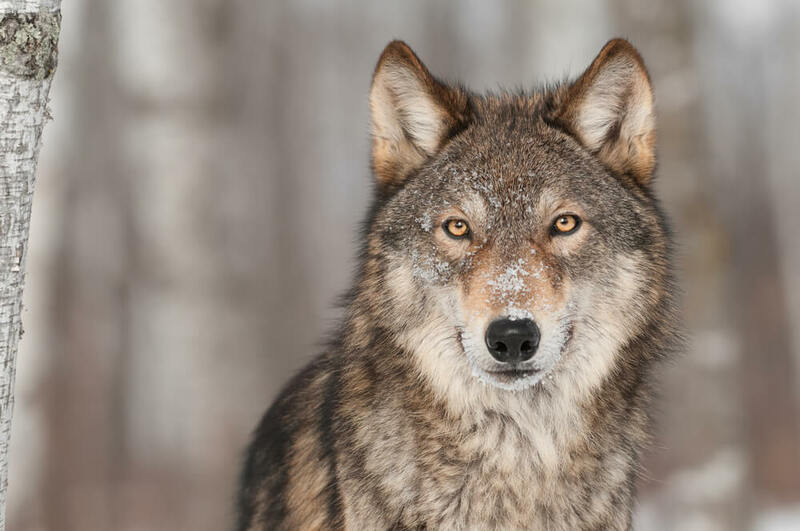 It’s not surprising then that these genes are absent in wolves, meaning they don’t have that genetic machinery required to be able to break down starch. This shows that during their domestication, dogs evolved genetic changes that made them able to digest the food that was available to them – starchy food. It also supports the ‘village dog’ hypothesis, and shows that at the fundamental, genetic level, dogs aren’t the same as wolves. A branch of science called taxonomy is used to describe, identify, name and classify all the different species in the world. According to taxonomy classification, dogs and wolves are different subspecies of the same species, Canis lupus. This means the modern domestic dog and grey wolves are in the family same family, Canidae, which in turn is a suborder of the family Carnivora. So are giant pandas. And as we all know, giant pandas are herbivores who eat only bamboo. This shows that just because animals are classified as being in the same family or order according to taxonomy principles, it doesn’t mean they are biologically the same or that they have the same nutritional needs. It’s also worth keeping in mind that dogs are omnivores (or facultative carnivores), who have evolved to eat almost anything from meat to vegetables, whereas wolves are carnivores. Our modern dogs have been feed cooked foods that were given to them by humans for a very long time. It’s not surprising that dogs have evolved to eat a diet not too dissimilar to humans– their domestication is widely believed to have happened alongside the evolution of humans. Essentially, man and dog coevolved together. And while this coevolution has resulted in dogs being considered man’s best friend, there is a darker side to domestication. Changes in the living environment, social relationships and diet of dogs that went alongside domestication inevitably resulted in changes to the species. And while some of these changes were beneficial and necessary for survival (for example the starch digestion genes described above), others were less desirable. Because only a small population of grey wolves underwent domestication to become today’s modern dog, this meant there was a small pool of genetic variability to begin with. And over time, selection for traits that promoted survival among the newly formed subspecies resulted in an even greater reduction in the gene pool size. Combined, this resulted in a genetic bottleneck around the time of dog domestication and an increased number of so-called ‘deleterious genetic variants’ – genetic mistakes that can cause problems. Essentially, domestication and the selection of specific traits when breeding has resulted in a loss in healthy genetic variation among dogs. This can in turn lead to health problems, such as breathing problems seen in pug, or the sloping back of German Shepherds. Putting all of this information together doesn’t definitively tell us what the optimal diet is for modern, domesticated dogs. That’s because there is no one, single diet that is suitable for every dog. Diet is about getting the right nutrients to your dog so that he or she remains healthy and active – and for each dog this is different, because no two dogs are the same. And in the same way that no two dogs are the same, thousands of years of genetic evolution, natural selection and selective breeding mean dogs and wolves aren’t the same. This means dogs don’t have the same nutritional needs as wolves. But what all of this information does show us it that human involvement and thousands of years of evolution have shaped our dogs to become genetically, functionally and anatomically different from their grey wolf ancestor.